Narcissism in its extreme forms is considered a personality disorder. It is defined as a syndrome or combination of characteristics that includes the following: (a) a pervasive pattern of grandiosity, self-importance, and perceived uniqueness; (b) a preoccupation with fantasies of unlimited success and power; (c) exhibitionism and attention seeking; (d) emotional reactivity especially to threats to self-esteem; (e) displays of entitlement and the expectation of special treatment from others; and (f) an unwillingness or inability to show empathy. 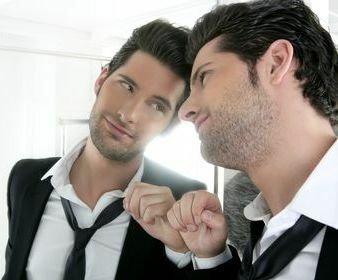 Researchers have also investigated a less-extreme form of narcissism that is termed the narcissistic personality type. These individuals possess most or all of the characteristics of the narcissistic personality disorder but are considered within the normal range of personality. Several self-report measures of narcissistic personality have been used to identify narcissists for research purposes. The most widely used scale is the Narcissistic Personality Inventory (NPI), and it is thought to measure both narcissistic personality disorder as well as narcissism in the normal population. The NPI is understood to contain at least four subscales: leadership/authority, superiority/arrogance, self-absorption/self-admiration, and entitlement/ exploitativeness. However, an individual must score fairly highly on each dimension to be considered a narcissistic personality type. Clinical theories of narcissism posit that adult narcissism has its roots in early childhood experiences. Although Sigmund Freud originally applied the term, Hans Kohut and Otto Kernberg are the two most influential theorists in the area of narcissism. Both Kohut and Kernberg focus on disturbances in early social (parental) relationships as the genesis of adult narcissistic personality disorder. Also, both view narcissism at its core as a defect in the development of a healthy self. According to Kohut, the child’s self develops and gains maturity through interactions with others (primarily the mother) that provide the child with opportunities to gain approval and enhancement and to identify with perfect and omnipotent role models. Parents who are empathic contribute to the healthy development of the child’s self in two ways. First, they provide mirroring that fosters a more realistic sense of self. Second, parents reveal limitations in themselves that lead the child to internalize or assume an idealized image that is realistic and possible to attain. Problems are introduced when the parent is unempathetic and fails to provide approval and appropriate role models. According to Kohut, narcissism is in effect developmental arrest in which the child’s self remains grandiose and unrealistic. At the same time, the child continues to idealize others to maintain self-esteem through association. Kernberg argues that narcissism results from the child’s reaction to a cold and unempathetic mother. His theory is quite the opposite of Kohut’s position. According to Kernberg, the emotionally hungry child is enraged by his parents’ neglect and comes to view them as even more depriving. Narcissism in this view is a defense reflecting the child’s attempt to take refuge in some aspect of the self that his parents valued; a defense that ultimately results in a grandiose and inflated sense of self. Any perceived weaknesses in the self are split off into a separate hidden self. Narcissists, in Kernberg’s view, are grandiose on the outside but vulnerable and questioning of their self-worth on the inside. The theories of Kernberg and Kohut are different in many important respects; however, both characterize narcissists as individuals with a childhood history of unsatisfactory social relationships who as adults possess grandiose views of the self that foster a conflicted psychological dependence on others. More recent social and personality psychologists have studied narcissism as a syndrome or collection of traits that characterizes the narcissistic personality type as opposed to narcissistic personality disorder. This perspective views narcissists as people who are preoccupied with maintaining excessively positive self-concepts. These individuals become overly concerned about obtaining positive, self-aggrandizing feedback from others and react with extreme positive or negative emotions when they succeed or fail to receive information that others hold them in high regard. Narcissists want positive feedback about the self, and they actively manipulate others to solicit or coerce admiration from them. In this view, narcissism is thought to reflect a form of chronic interpersonal, self-esteem regulation. The diagnosis of narcissistic personality disorder is usually determined through clinical evaluation of the person. However, the narcissistic personality type is measured through self-report questionnaires such as the NPI. This questionnaire presents respondents with a set of forced-choice items in which they must decide which of two statements is most descriptive of them. For example, a person completing the NPI would be asked whether the statement “people always seem to recognize my authority” or “being an authority doesn’t mean that much to me” best describes them. People who score high on the NPI have been shown to display a wide variety of narcissistic behaviors such as arrogance, superiority, and aggressiveness. In addition, people with a clinical diagnosis of narcissistic personality disorder score higher on the NPI than do people with other psychiatric diagnoses or normal controls. Research findings employing the NPI describe a portrait of narcissists as possessing inflated and grandiose self-images. It is not surprising then that they report having high self-esteem. However, these positive self-images appear to be based on biased and inflated perceptions of their accomplishments and their distorted views of what others think about them. For example, they overestimate their physical attractiveness relative to judges’ ratings of their attractiveness, and they overestimate their intelligence relative to objective assessments of their IQ. In one experiment, narcissistic and nonnarcissistic men were interviewed by a woman whose responses were completely scripted. That is, all men received the same social feedback. Nonetheless, narcissistic men believed that the woman liked them better and was more romantically interested in them than did nonnarcissistic men. Other findings indicate that narcissists take greater credit for good outcomes even when those outcomes occurred by luck or chance. Although narcissists’ self-esteem is high, it is also fragile and insecure. This is evidenced in that their self-esteem is much more variable, fluctuating from moment to moment, day to day, than is the self-esteem of less narcissistic people. Other research indicates that narcissists are more likely to have high explicit self-esteem and low implicit self-esteem. This finding suggests that although narcissists describe themselves in positive terms, their automatically accessible self-feelings are not so positive. Narcissists’ positive but insecure self-views lead them to be more attentive and reactive to feedback from other people. However, not just any response or feedback from others is important to narcissists. They are eager to learn that others admire and look up to them. Narcissists value admiration and superiority more than being liked and accepted. Studies find that narcissists’ self-esteem waxes and wanes along with the extent to which they feel admired. Moreover, narcissists are not passive in their desire for admiration from others but, rather, pursue it by attempting to manipulate the impressions they create in others. They make self-promoting and self-aggrandizing statements and attempt to solicit regard and compliments from those around them. It follows that if narcissists are constantly seeking positive feedback from other people then they should react negatively when people around them fail to provide such support. Accordingly, narcissists respond with anger and resentment when they feel threatened by others. They are more likely to respond aggressively on such occasions. They will derogate those who threaten them even when such hostile responding jeopardizes the relationship. Narcissists attempt to solicit admiration from those around them, and their hostility when others fail to respond appropriately contributes to the disturbed interpersonal relationships that are a hallmark of the disorder. Research has shown that people describe their narcissistic acquaintances as trying to impress others by bragging and putting down others. These behaviors are initially successful in that interaction partners find narcissists to be competent and attractive. However, over time these partners come to view the narcissist as arrogant and hostile. Findings from an impressive range of studies suggest a picture of the narcissists as people who use their friends to feel good about themselves. They pander for attention and admiration to support self-images that are positive but easily threatened. They are constantly on alert for even the smallest slight that they perceive as disrespect. Perhaps most important, narcissists’ striving to self-enhance at the expense of their friends ultimately costs them the friendships. Rhodewalt, F. (2005). Social motivation and object relations: Narcissism and interpersonal self-esteem regulation. In J. Forgas, K. Williams, & S. Laham (Eds. ), .Social motivation (pp. 332-350). New York: Cambridge University Press. Rhodewalt, F., & Morf, C. C. (2005). Reflections in troubled waters: Narcissism and interpersonal self-esteem regulation. In A. Tesser, J. Wood, & D. Stapel (Eds. ), On building, defending, and regulating the self (pp. 127-151). New York: Psychology Press. Rhodewalt, F., & Sorrow, D. (2003). Interpersonal self-regulation: Lessons from the study of narcissism. In M. Leary & J. P. Tangney (Eds. ), Handbook of self and identity. New York: Guilford Press.